Where is the ceiling for Wilfried Zaha? A few years ago, mentioning Messi and Zaha in the same sentence could have been treasonous, but now has being compared to the five time Balon d’Or winner for his dribbling abilities. That comparison on it’s own is quite an achievement, but the the 25 year-old Ivorian striker is does not seem to be at the peak of his career yet. Is this Messi association the best he could do or is this just the beginning of the more he could do and become? 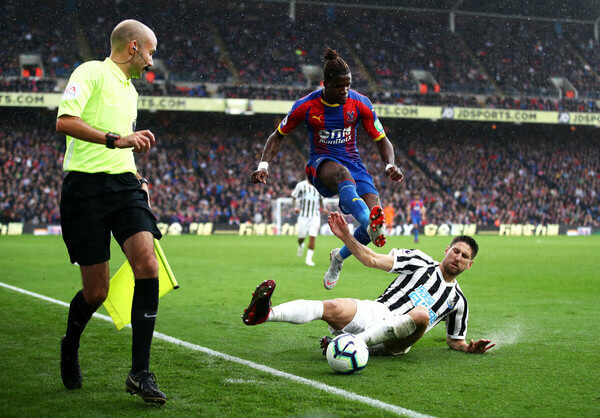 Wilfried Zaha of Crystal Palace jumps clear of a challenge from Federico Fernandez of Newcastle United during the Premier League match between Crystal Palace and Newcastle United at Selhurst Park on September 22, 2018 in London, United Kingdom. He has been commended for his fantastic dribbles that he completes with half steps, cutting inside from the wing and making defenders sweep the floor with any part of the body he chooses, regularly the limbs and hair on occasion. On top of that his speed on the ball electric, super sonic stuff. He has become not just a playful dribbler but an effective one at that, scoring important goals for Roy Hodgson’s men. At the start of the 2017/18 EPL season, he netted three goals in two matches for Crystal Palace take his tally to 24, an all time high for an Eagles player in the Premier League. The Selhurst residents really do miss his goals, hair and everything Zaha in periods injuries which has been quite a few in recent times. It’s not unfounded to say that Zaha is Crystal Palace’s playmaker, creating goals for teammates and scoring even more. Henceforth comparisons to Messi are not shocking, the Argentine has just however done the same thing for Barcelona in the La Liga for an extend period of time. Could it be that Zaha reaching such a level at mid-table club like Palace in the English top flight signals the commencement of even a bigger career rather than mere committed service and loyalty? It sure looks like Zaha, with no disrespect intended, has outgrown the club. Actually, reliance on him might be more damaging than the perks of his brilliance. The conversation around him moving to a bigger club? As anticipated, discussions around him potentially moving to a bigger team like Tottenham, Dortmund, Real Madrid or Barcelona have been far from over, even though he recently renewed his commitment to the London club. An obvious argument to a move away would be exposure to other great players propelling him to concentrate on personal growth without the ‘pressure’ of carrying the team on his shoulders. Zaha did however play for a bigger club, Manchester United from 2013-15 managing just two appearances in two years. Some feel like he is play that feeds of the limelight and that he was overshadowed and got his light dimmed at United. Could it be that he was still young and a growing footballer who lacked someone who unequivocally believed in his abilities. Well, I would like to believe that no matter the challenge this time around or club, cannot be too big for Zaha. You do just become one of the most dreaded forwards in the English Premier League for no reason. Wilfried Zaha of Crystal Palace battles for possession with David Brooks of AFC Bournemouth during the Premier League match between AFC Bournemouth and Crystal Palace at Vitality Stadium on October 1, 2018 in Bournemouth, United Kingdom. The Ivorian striker becoming dangerous defenders in the premier league has also seen the defenders arguably becoming a danger to him. He recently called out for more protection as the most singled out player, alluding that maybe he would need to have one of his legs broken before being taken seriously. Maybe he has indeed divided on some occasions but it goes without saying that being the centre of attention because of his abilities and threat he poses to any opponent, more protection would be required. Both from potential haters or shielding himself from naysayers. On Monday evening, Crystal Palace lost their game to Bournemouth . As soon as the whistle blew, seemingly frustrated, Wilfried Zaha gave his coach a brief handshake and rushed to the dressing room. The fans who had been watching him for ninety minutes could have appreciated more, a custom applause for their unwavering support despite the result. With his abilities at an time high is his career and the desire to win more increasing with every performance, Zaha might possibly be seeing more and demanding more of himself than the entire world has ever seen. Most are already dazzled with what he has given so far, could words be coined to what else he can bring to the Africa and global football in general. FT African Legends Series: Perpetua Nkwocha, the best ever?